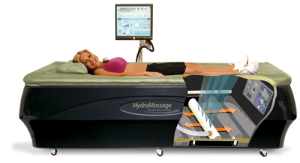 HydroMassage at Northeast Chiropractic Center is a fully customizable, user-friendly massage system that gives you a powerful, heated, deep-tissue massage in as little as 10 minutes. You will stay fully clothed, dry and comfortably supported while powerful waves of water are directed at specific areas of the body – giving you the deepest and most relaxing massage available. HydroMassage offers all the benefits of traditional massage without the expense or time commitment. Now you can experience an incredible massage every day! Ask the front desk about getting your FREE trial and our special introductory pricing!